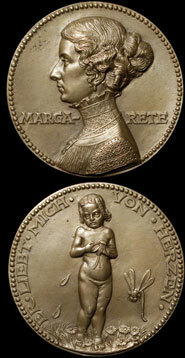 Karl made a number of medals with Margarete as the subject matter. These were some of his finest work and were undoubtedly created with love. 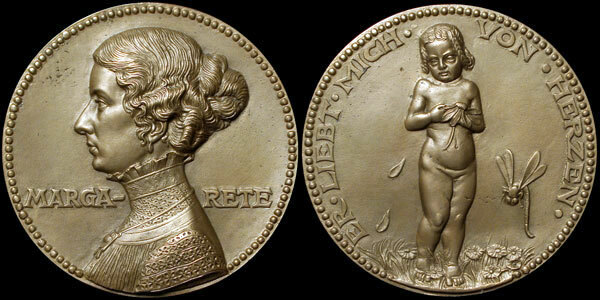 In addition to the K-63 wedding medal already discussed, Karl made a beautiful portrait medallion, K-62, of Margarete sometime between the time of their meeting and their wedding. The medal isn't dated. 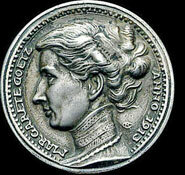 Likewise, another small uniface portrait medal was made in 1913. Perhaps for no other reason than a first anniversary commemorative of Margarete.